Hi everyone! Sorry for the recent lull in blog updates- It's been a busy holiday season with lots of problems in terms of uploading videos. Until just recently, I have struggled for hours with every video upload... now I've changed internet providers (last effort to help the situation!) and things appear to be working better. Anyway, all the stress and time that the situation required has kind of kept me away from my blog. Not anymore though! I'm excited to share with you- my first ever swap! For a closer look at a few of these products and other Christmas/Birthday gifts I received- check out my YouTube Christmas & Birthday Haul 2010 video! For awhile now, I've been chatting back and forth on Twitter with Abby, who also has a blog, and a YouTube channel called Color Swept Beauty. She asked me about doing a Christmas swap, and I thought it sounded like lots of fun! We set our price limit at $50... (which she clearly didn't stick to- LOL) and in the days before Christmas I received this amazing package of items! Not only did she send me mountains of makeup, but she had them wrapped in little bundles- and with the package came a series of cards. They instructed me on which part of the gift to open, and why she chose those particular items. It was probably one of the most fun gift-opening experiences ever! :D Not to mention super creative and thoughtful. Just for a closer look at some of the items- one of the stars of the show was this Smashbox Eye Wish palette! It's a gorgeous gold palette packed with shadows, cream liners, a mascara, and a primer. I love Smashbox, and after trying this palette, I can tell you that it's classic Smashbox quality! Abby has great taste! Abby also picked out gift sets from Target from a couple of brands she enjoys- Pixi and Jemma Kidd. These are sort of the "high end" portion of Target cosmetics, and something I haven't yet tried. I'm excited to dig in to these sets and see how it works for me. She also threw in a number of individual makeup products that are either favorites of hers, or something she thought I'd enjoy. 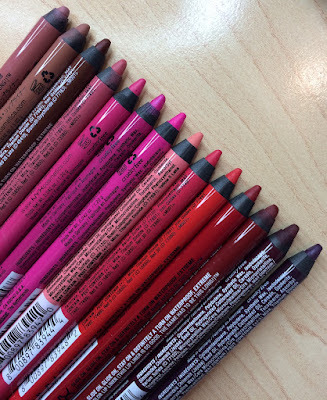 There were mascaras, eyeshadows, lipsticks, lip glosses, lip balms, pencils... everything!! Amazing! I hope everyone continues to enjoy the holiday season, and have a great day! I've had 2 days off following the Christmas weekend, and I have been enjoying myself tremendously. Tyler and I went out to eat last night at Applebee's for my birthday! I am a chronic chicken-strip orderer. My obsession over things that smell good (bath products, air fresheners, etc.) is growing. I don't plan to take down my holiday decor until after New Year's... I feel like we're still in the "holiday season". Pajamas and slippers have been my favorite things to wear lately. I was given several seasons of Mad Men on DVD for Christmas. Just got started on it last night- I think it's gonna be good!! Aww that was so nice of her to go all out like that! Hope you enjoyed your Christmas and birthday and have a great New Year's Eve. I'm glad someone besides me is a chronic chicken strip orderer :P Everyone makes fun of me! What a great beauty swap!! I'm sure you'll enjoy them all! Haha! I love the Chicken Strip Platter from Applebee's. :) Ever dipped them in honey mustard sauce? Fantastic! Regarding your nugget about Christmas decorations: you will be pleased to know that Christmas does not end until January 6th, also known as Twelfth Night! As in, the 12 Days of Christmas! It originates from the Christian tradition and marks the Epiphany, when the Wise men found Jesus. I see it as an excuse to extend the Christmas festivities and another night to have a party!! i love love love all of your videos and your blog posts; they are so informative and honest, thank you! What a great swap Emily!!! 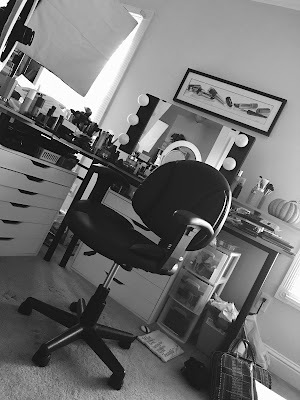 I used to swap years ago over on MakeupAlley...and that was always so much fun! Recently, now that I am blogging, I have started swapping again with other bloggers and it is just too much fun! LOVE shopping for makeup for other people! :) Plus, its like getting a present in the mail! Have fun playing with all your new things Em!!! XOXO! Oooo soooo nice ;) now i wanna do a swap too. I think you will LOVE Mad Men- we do! Such a great swap, I'm really interested to hear your review of the Smashbox palette. If you EVER want to do a swap with a Canadian I'm game. You can send me a note here or thru twitter (twiggskitty). Wow what an amazing product swap!!! Glad you've had a few much needed days off of work. I'm all for not taking down my Christmas decor until after New Years also...it IS the Christmas "season" after all! I don't want it to end any sooner than it has too! Wow Abby sounds really great and fun. Such a lovely selection of gifts. And quite a range tooo!!! she definitely is a gem! im new to blogging and I've just followed you, I hope you'd follow me back. Wow this is a great swap. Have a nice day! Love your Channel!!! I had to laugh about cupcake falling in the tub!! We have a new kitten and has fallen in the tub with me 3 times!!! I could not stop laughing when it happened!! Keep the videos coming!! I love them and you are such an inspiration!!! You got awesome gifts and happy bday! BTW I wanted to recommend to you an awesome foundation by boots no. 7. It's called the firming and lifting foundation and it can be found at target. I love this foundation and I'm sure you'll enjoy it too. Wow! Abby was so generous!! What an amazing swap :) I bet you're excited to try out all the products!